Spire by Fiona Snyckers is a recommended thriller set in Antarctica. Dr. Caroline Burchell is a surgeon and virologist who has been chosen to join the team of SPIRE and spend the winter in Antarctica doing research. SPIRE stands for the South Pole International Research Establishment. Caroline has brought vials of cryogenically frozen viruses that she plans to study over the 8-9 months she will be there. Before she can even begin her research though, the whole team there is coming down with a wide ranging number of diseases that are represented in her vials. The only problem is that the seals on her vials are all still intact which means someone else has brought the same deadly diseases to the station and released them. Soon Caroline is the only survivor with no hope of rescue in sight; however soon mysterious occurrences in the station make her suspect that there may be another survivor hiding from her. The set up to Spire is intriguing as I am always up for virus-outbreak stories. Then it changed into potentially an exciting lone-woman-against-the-elements story. For a brief, shining moment I thought it was going to be sort of a twist on The Martian, or Endurance, only with a female doctor trapped at an Antarctica research station, but it soon lost some of its initial momentum and morphed into something else. The quality of the writing is adequate, no glaring problems and written in a simple, easy to follow style reminiscent of a YA novel. Once the story changed, it lost its energy. The viruses were introduced to eliminate everyone and add a twist that was, quite frankly, not very believable. Add to this Caroline's finding a cat at the station, and her ability to use the internet, contact people, including colleagues and her family, Skype, etc., made the disorienting sense of isolation and solitude vanish. The horrible sense of isolation and potential for death, etc., was really only fully utilized during one part of the plot. FYI, it's also not a very tech-savvy novel for those of you who care about such things. Now, it is still an interesting story. It was easy to set all my misgivings aside and just enjoy the novel as is. Don't expect any great use of the viruses, though, beyond a plot element to isolate Caroline. This is an airplane book. It will hold your attention and help pass the time but you won't worry if you never finish it. 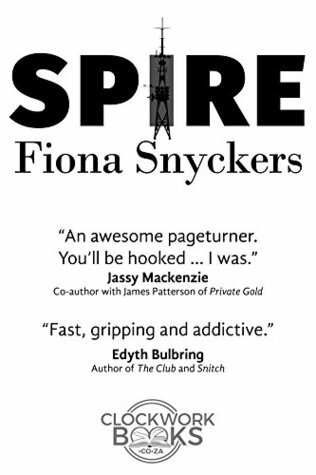 Apparently it is a sequel to the novel Now Following You, but you won't need to read that before Spire. Disclosure: My review copy was courtesy of Clockwork Books.